The unit includes a White LED Flashlight, UV Light and Red Laser Pointer. Two button operation for convenience, One button controls the laser while the other button controls the lights. 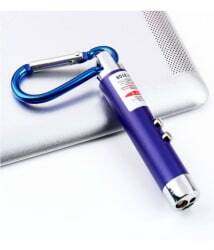 Use the laser pointer for presentation or marking a object from far. The UV Light helps detect fake currency notes & documents. The Flash light or torch can help in case of emergency or at night.